I was given some cilantro by a neighbor the other day and was itching to use it. I LOVE cilantro. 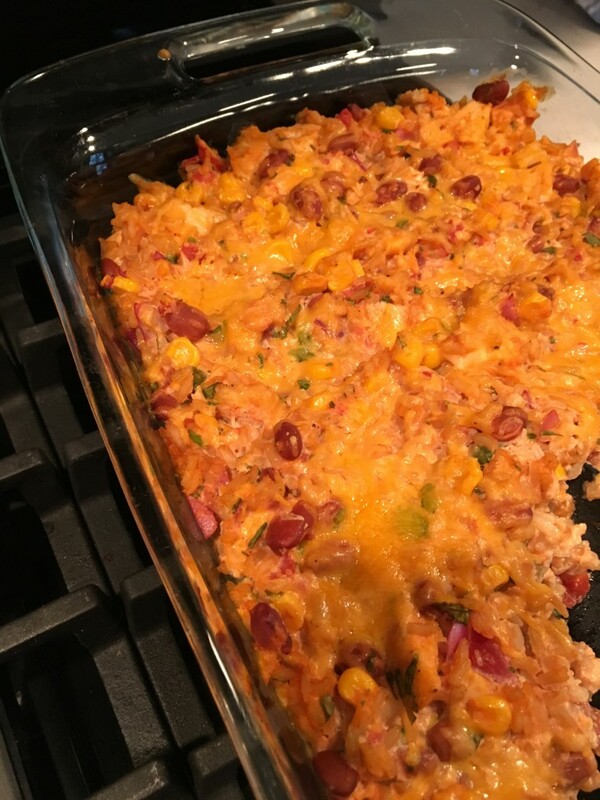 I scoured my Pinterest Food Board and came across this Cheesy Chicken and Rice Bake recipe. Most of the ingredients I had on hand, but I also had to do some improvising. Here’s the original recipe. My version is below. 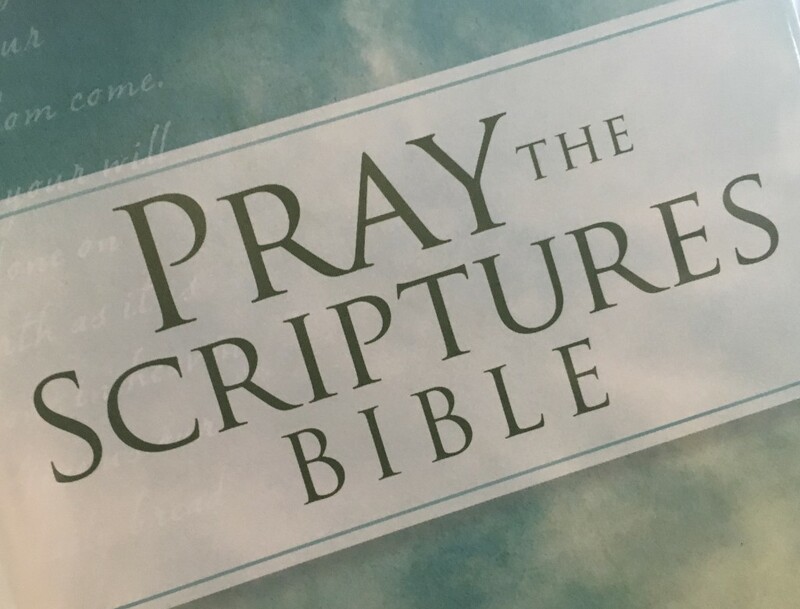 In a recent small group Bible study, we discussed the importance of and power in praying scriptures. If you pray directly from God’s Word (with the appropriate motives), you know it’s aligned with His will. How awesome is that?!? I hate to admit it, but I’m just not great at regularly praying for my husband. Improvement in this area is a must! I’ve chosen several scriptures to pray for him, and I’m so excited to start praying these on a regular basis! Oh, also, you’ll notice many of my prayers contain the phrase so that. Our pastor once suggested that our prayers should be so that prayers. For example: Lord, please help me be slow to anger, slow to speak, and quick to listen so that I am a reflection of you. I’ve come to absolutely love so that prayers. It makes me pause to think about my true intentions behind praying for whatever it is I’m praying for. Is it out of selfishness? Anger? Jealousy? Or is it out of care and concern for someone? Love for Jesus? My desire to be more like Jesus? I encourage you to begin praying so that prayers, too! Simply insert your husband’s name where it says my husband, and you’ve got a prayer personalized for him! Lord, I pray that my husband loves You with all his heart, all his soul, and all his mind so that all he does and all he is is a reflection of You. I’m on a mission to declutter this year. We have way too much stuff for our space. Actually, we have way too much stuff, period. There’s no need for it. Why are THINGS so important to me? In the end, my things aren’t going to matter anyway. Instead of a New Year’s Resolution, our pastor encouraged us to pick a word to serve as our theme for the year. I chose the word surrender, as in surrendering to Christ and His plans for my life. I really want to live a life for Him, but it’s just so dang difficult! Why??? Grrr. Anyway, I think letting go of many of my material things is part of surrendering my life to Christ. My focus should be on the eternal, not the temporal. “Set your minds on things above, not on earthly things” (Colossians 3:2). 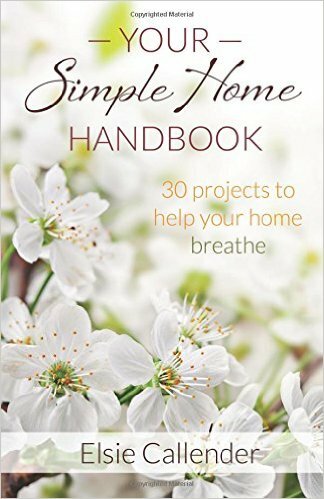 While doing some searching online, I stumbled upon Your Simple Home Handbook by Elsie Chandler. It has really good suggestions for decluttering, even though I probably won’t declutter quite to the extent suggested. I’m starting with baby steps! We’ll see how it goes. So far, all I’ve semi-decluttered is my closet. Pretty slow pace, huh? What declutter plans have worked for you? I adored my great grandma, affectionately know as Granny, and known to me as Grandma NeeNee (I couldn’t say ‘Granny’ when I was younger; it came out as ‘NeeNee’). In fact, I think everyone adored her. She was just fun to be around and very adventurous. Chicken Broccoli Alfredo: At first, this tasted pretty good, but after several bites it just got gross. Beef Stew: This was actually edible and tasted ok. It’s not worth making again, though. Maple Dijon Glazed Chicken: We ate this over rice. Without the rice it would have been inedible. It looked really gross, too, lol. Cilantro Lime Chicken with Corn and Black Beans: This was ok. It would have tasted better served with tortilla chips. I won’t make it again. Italian Beef Sandwiches: We would definitely make this again. It’s one of our favorites. I think it tastes better as a non-freezer meal, though. The original post is below with my updated comments included at the beginning of each recipe. Hopefully you’ll have better luck than I did with freezer meals! In preparation for our baby girl’s June 6th due date, I decided to make some freezer meals. With the help of my bother, I was able to prepare five freezer meals in less than an hour (including clean up). Not too shabby! The grocery shopping probably took an additional hour. I’m just not a very efficient grocery shopper, plus I just despise doing it! Look at all those groceries :/ (most of them were for the freezer meals, but not all). August means back-to-school! 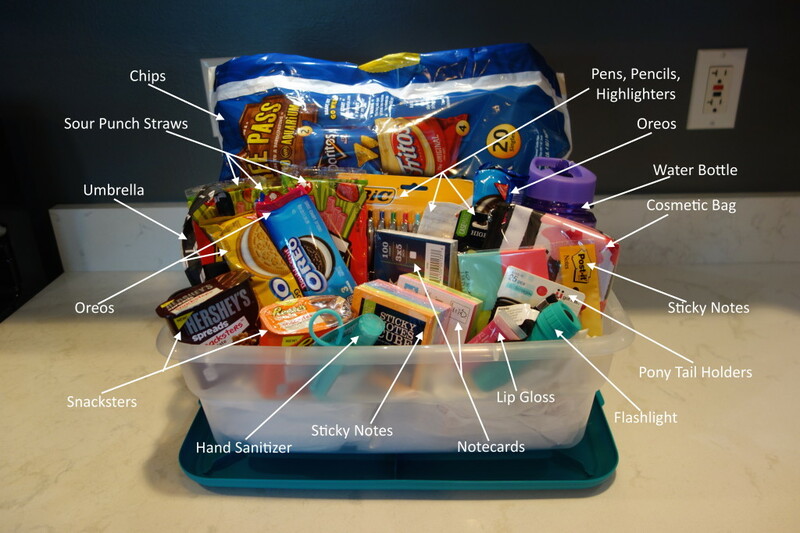 If you’re looking for something to give a college student, a gift basket is a great option. Some family members of mine are going off to college, and I wanted to give them a practical gift as they start this exciting time in their life. I opted for gift baskets because who doesn’t like a gift basket??? Plus, I really enjoy making them . I scoured the internet for ideas of what to include in the baskets and came up with some ideas of my own as well. I’ll share with you the items I included in the two gift baskets below. One is for a commuter college student, and the other is for a college student moving out on her own for the first time. Gift baskets are so simple and also allow you to be creative! Buy a basket or storage container of some sort, cover the bottom with some crumpled up tissue paper, and start filling it with all the goodies! 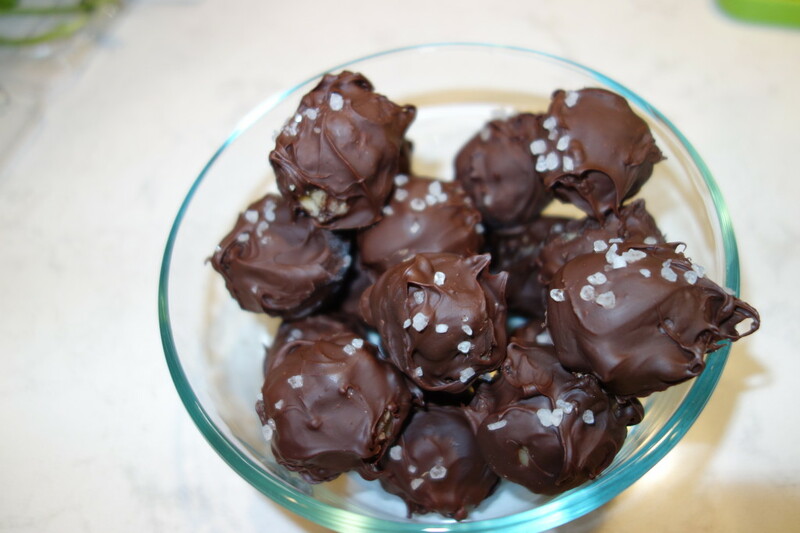 I found the recipe for these no-bake cookie dough truffles on Pinterest. 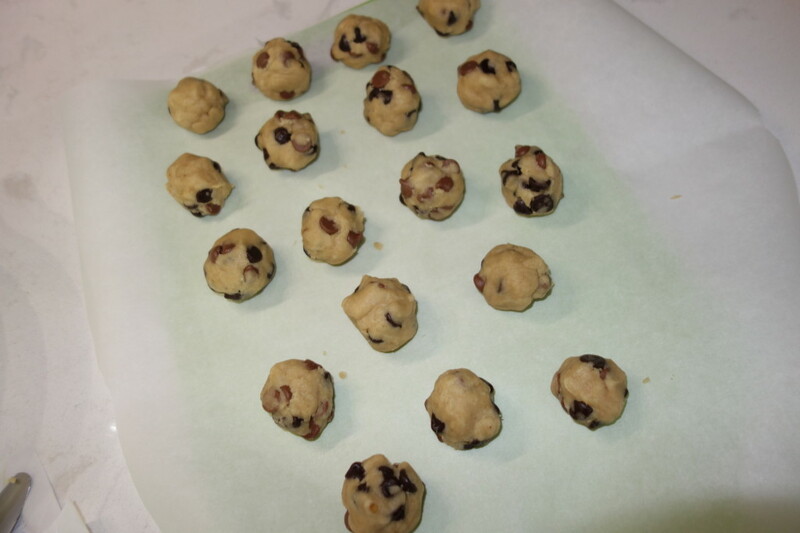 They only take a few minutes to make, plus the time it takes for the dough and chocolate to harden. The not-so-great part is they are definitely NOT healthy . It’s ok to indulge every once in a while, though . 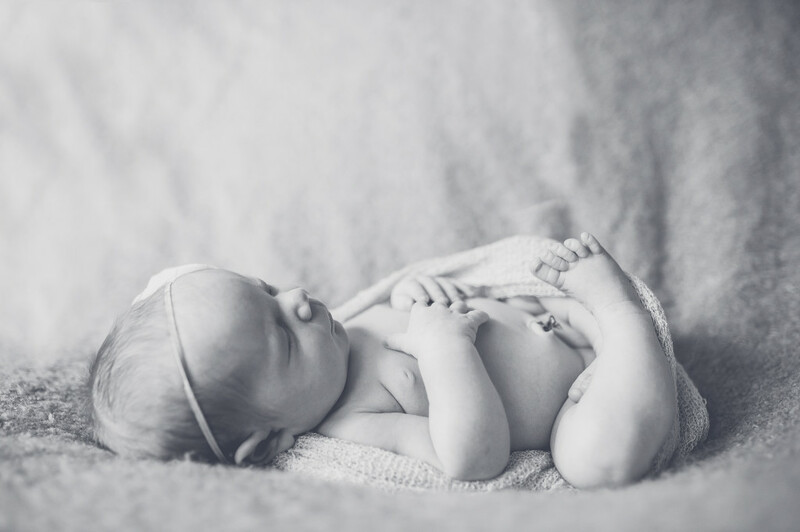 After years of prayers and prayers and prayers, we are so thrilled to share that our baby girl arrived on June 5th, 2015. She’s happy, healthy, and beautiful (I know, I’m biased )! 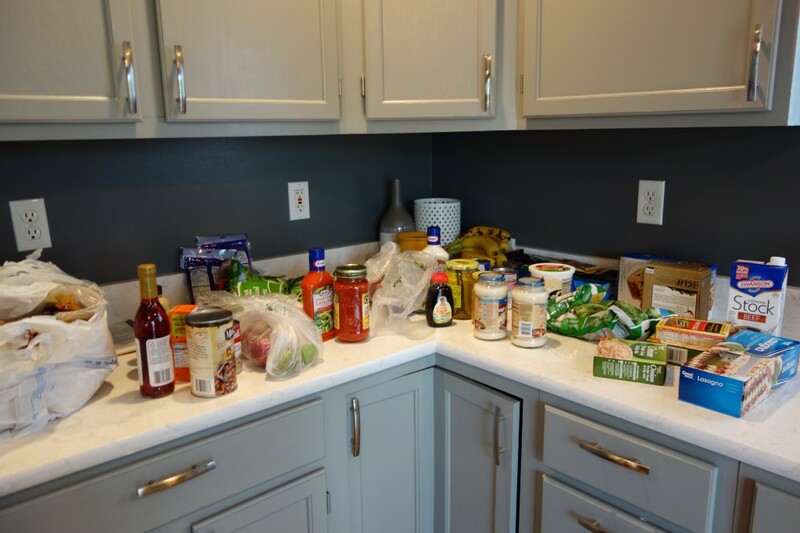 Shortly after we updated our kitchen, I was preparing to take pictures of it for this post. As I was cleaning, I moved a rinsed-out mixed vegetable can I had put on the counter behind the sink the evening before and noticed RUST SPOTS on our BRAND NEW quartz countertops! I could not believe it! What bugged me the most was that when I put the can on the counter I even thought to myself, “This might leave rust marks. Maybe I should move it.” However, I decided against it because I knew I would be cleaning the kitchen the next morning. I thought “It won’t leave rust marks that quickly.” Well…I was wrong! I tried cleaning the rust with vinegar – didn’t work. Windex (which is what the countertop installers recommended I use to regularly clean the counters) – didn’t work. Scratching the spot with my fingernail – didn’t work. I think I finally searched online for products that removed rust. 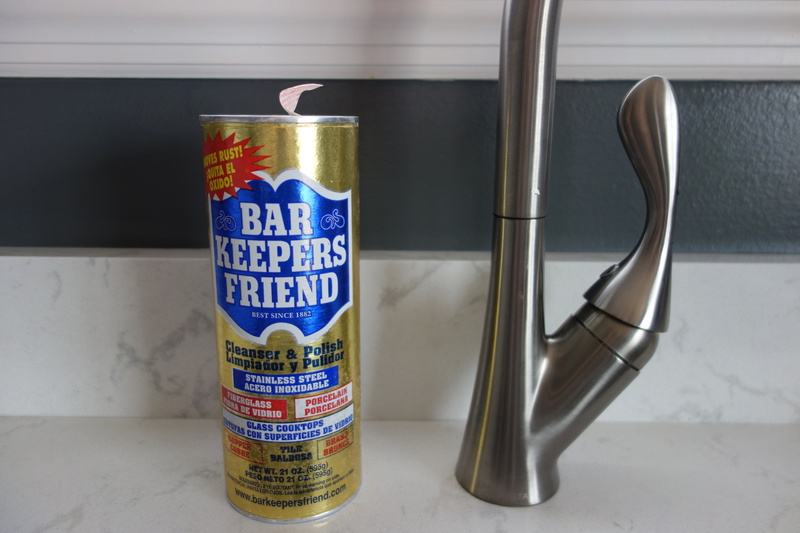 Anyway, somehow I remembered this powder cleaner called Bar Keepers Friend that my grandma told me about years ago.